Captain Marvel #3 ends with a familiar plot device: The surprise introduction of a new antagonist on the final page. The rest of the comic is a good, satisfying read, so I wouldn't dream of spoiling it. It's not a very big secret, though; go find the cover to #4 if you've got to know right this minute. I admit I'm in two minds about the ending. I have some superfan grumbles about how often Carol seems to get tripped up by resurgent bits of her convoluted backstory. But those grumbles are more than outweighed by the squealing glee produced by imagining how ridiculously awesome the slugfest in #4 is probably going to be. Prior to the big finale, Carol does a lot of work with the Resistance. She saves the de-hulked She-Hulk, fights robots, commands troops, strategizes, inspires, and above all, leads. I have to be careful to give the middle section of this comic full credit. I was reading the first two issues very carefully, and I puzzled out most of Carol's characterization in advance - the strength, the compassion, the friendship, the wisdom to keep her doubts to herself. #3 takes all that subtextual goodness and makes it explicit, and it does it with strong words and visuals. But it also takes its sweet time advancing the plot. Carol collects and cogitates on everything we know so far about Mahkizmo's plans. Her token male ally, Som, provides useful information as well as some "obvious trap" information. Carol and friends, thank goodness, have the wisdom to see that and handle Som wisely. One part of the plot review is confirming that yeah, Mahkizmo is interested in Carol for completely skeevy "forced marriage and impregnation" reasons. She reacts with appropriate outrage and asserts that she's the last woman you want to target that way. I think the reference strikes a clever, subtle balance. It neatly encapsulates Carol's past experience without digressing into details, and it really doesn't have to. You can understand Carol's fury perfectly well if you're coming to this story straight from the movie theatre or if you're Thanos-style "burdened with knowledge" of the infamous Avengers #200. The colour palette sticks to its grim post-apocalyptic shades and a majority of the book is set in the night, but the resistance members get consistent, warm overtones that humanize them and do a good job of pushing them out in front of the settings. There's also a blockbuster of a Binary spread right at the front of the book that should be a proud moment for every member of the art team: Great characters, great motion, great colours. 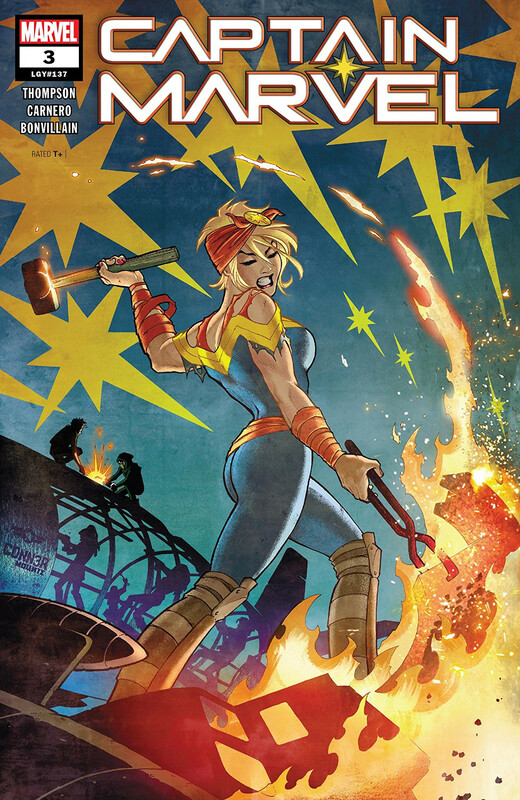 In its third issue, Captain Marvel slows the plot down to make sure every reader understands both Carol's awesomeness and the scope of the challenge she faces. It's beautifully drawn and strongly written. It proves that this creative team can make Carol's story compelling without constant plot twists. And once that point is proved, the issue closes with an extra-crazy twist just to make sure it's in no danger of losing our attention. I have one more qualm about #4: This issue doesn't set a good track record for surprise guest star utilization. Though there are good (and surprisingly subtle) reasons to sideline Jen Walters, #3 is awful far from the "Cap'n Marvel & She-Hulk team-up" the solicit suggests.